The Hot air fan TECH:is a fan blade powered by a stirling cycle engine. This is a big version of the biggest stirling engine hot air fan when compared to the stirling fans produced around the turn of the century. Originally designed to provide air circulation where electric power was not available. The stirling hot air fan used a small fuel burner for the external combustion source of heat, and maintain the thermomechanical process of heating and cooling the air inside the engine to drive a piston attached to a crank, thus spinning the fan blade. The proto-type stirling hot air fan shown here is intended to be mounted in the cook surface of a wood or coal stove to drive a big fan blade and charge batteries by powering a stirling linear alternator, generator. 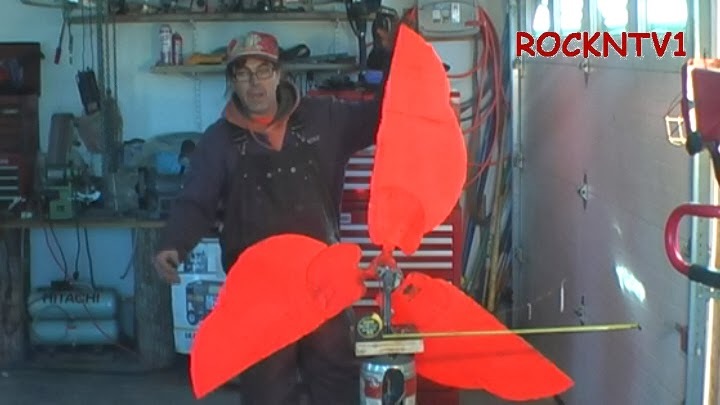 This very big version of the stirling hot air fan Is made from very big beer cans, and other recycled or scrap metal parts, and can be made with basic tools. This big 62" fan blade test probed a large increase in torque of the engine at the expense of rpm. However the air moved by the big fan blade is substantial and the reduction of rpm allowed a lower temperature differential to be used. The increased moment of inertia of the big fan blade will allow the use of a gear driven generator, not possible in earlier tests of smaller diameter fan blades.